Three people were in hospital after two horrific incidents on the busy A82 route between Fort William and Inverness. Emergency services were called to the Invergarry section of the road at about 1.40pm after a small bus crashed and landed on its side. Two people were underneath the vehicle after it overturned, although they were able to free themselves before help arrived. An air ambulance arrived and took a female in her 20s to Raigmore Hospital in Inverness. But a road ambulance that was taking the other casualty from the bus – a male in his 20s – then collided with a motorcycle by Loch Ness. The second incident happened on the A82 near Urquhart Castle at about 3.45pm – just as the road was re-opening following the crash further south. The male motorcyclist in his 30s, who was believed to have been part of a touring party from overseas, was also taken to hospital. It marked another dark weekend on the region’s roads, with a motorcyclist and a pillion passenger having been taken to Raigmore on Friday night after a collision with a car on the A9 Inverness to Wick road, just north of Dornoch Bridge. A Scottish Ambulance Service spokesperson said, “We attended a road traffic collision on the A82 at approximately 1340 hours on Sunday 16 July. “One female patient in her 20s was taken to Raigmore Hospital in Inverness by air ambulance. “An ambulance taking a male patient in his 20s from the incident to Raigmore Hospital was involved in a road traffic collision with a motorcycle on the A82. “The patient on board and a male in his 30s were transported to Raigmore Hospital by road ambulances. “We are assisting Police Scotland with their ongoing enquiries. The incidents led to the busy road being closed for several hours as thousands of people were making their way to Inverness for a concert by Canadian rock star Bryan Adams. Diversions of more than 100 miles were put in place, with drivers asked to turn around and use the A86 Spean Bridge to Kingussie road, and the Kingussie to Inverness section of the A9. The bus incident was attended by the air ambulance, along with five Scottish Fire and Rescue Service (SFRS) appliances from Spean Bridge, Fort Augustus, Drumnadrochit, Fort William and Inverness, as well as road ambulance and police. A section of the road was closed for around three hours while crews dealt with the incident. It is understood the bus belonged to a private tour company based in Edinburgh. A SFRS spokesman said two people were underneath the bus after it crashed but were able to free themselves before they arrived. They were taken to hospital but their injuries and condition were not known last night. As that section of the A82 re-opened at about 3.45pm, the road was closed further north after the second crash just south of Urquhart Castle. A police spokesman said: “Emergency services are currently in attendance on the A82 south of Urquhart Castle due to a road traffic collision. Meanwhile, on Friday evening two people were seriously injured in a crash on the A9 just north of the Dornoch Bridge. 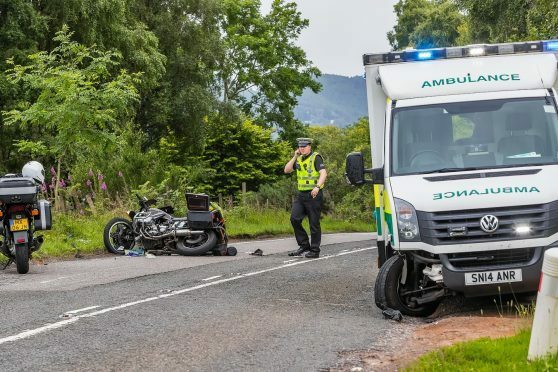 A motorcycle and a car collided at about 4.45pm on Friday, with the motorcyclist and pillion passenger taken to Raigmore Hospital in Inverness for treatment. The road was closed for several hours as investigations were carried out by the police. The conditions of those involved were not known last night. Police have appealed for information from anyone who may have witnessed the incident.